Whether you visit for the Winterfest & Chili Cook-Off event or just want to make a special plate for your family during their vacation to the Smokies, we’ve got the recipes for you that will keep them screaming for more! Try making a special pot for your family, the next time you stay in a log cabin in the Smokies & you’ll have the perfect vacation dish for the whole gang! Brown 2 lbs of chili grind; drain and set aside. Add 1 can of beef broth, 1 can of chicken broth, and 1 can of tomato sauce; bring to a boil. Once boiling, add two Serrano peppers, the 1st Dump and drained chili grind. Boil on medium heat for 30-35 minutes or until meat is done. Squeeze peppers into chili and discard the peppers. 45 minutes before turn in, bring chili to a boil. Add the 2nd Dump and cook for 30 minutes over medium to medium low heat. Check for salt and adjust if necessary. In large pan, cook beef, onion and green pepper until meat is browned. Drain excess grease. Stir in remaining ingredients, except cheese. Bring to boil. Cover, reduce heat to low and simmer for 20 minutes. Garnish with Cheddar cheese. Bush’s Beans’ factory is located near Sevier County. Their new facility is in Chestnut Hill, Tennessee. Their beans are world-famous. 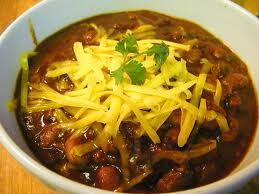 We bring you their All-American Chili recipe from East Tennessee. A good pre-game meal before visiting Dollywood, Ober Gatlinburg, Ripley’s Aquarium of the Smokies, or any televised Sporting Event (ie The Super Bowl)!